In the past decade or so, Linux distributions would occasionally fail before, during and after the installation, but I was always able to somehow recover the system and continue working normally. Well, Solus broke my laptop. Literally. GRUB rescue. No luck. Reinstall. No luck still! Ubuntu refused to install, complaining about the target device not being this or that. Wow. Something like this has never happened to me before. Effectively my test machine had become a useless brick. Should we despair? No, absolutely not. Let me show you how you can fix it. 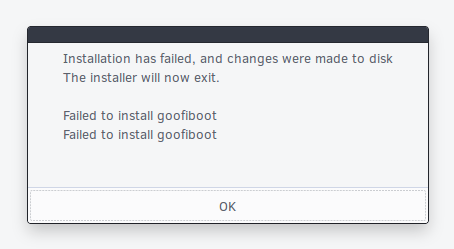 It all started with Solus trying to install its own bootloader - goofiboot. No idea what, who or why, but it failed to complete successfully, and I was left with a system that would not boot. After BIOS, I would get a GRUB rescue shell. I tried manually working in the rescue shell, using this and that command, very similar to what I have outlined in my extensive GRUB2 tutorial. This did not really work. My next attempt was to recover from a live CD, again following my own advice, as I have outlined in my GRUB2 & EFI tutorial. I set up a new entry, and made sure to mark it active with the efibootmgr utility. Just as we did in the guide, and this has served us well before. Alas, this recovery method did not work, either. I tried to perform a complete Ubuntu installation, into the same partition used by Solus, expecting the installer to sort out some of the fine details. But Ubuntu was not able to finish the install. It complained about: failed to install into /target. This was a first. What now? Obviously, something is very wrong with our EFI partition. Just to briefly recap, if you are using UEFI, then you must have a separate FAT32-formatted partition. This partition is used to store EFI boot images. For instance, when you install Fedora, the Fedora boot image will be copied into the EFI subdirectory. Every operating system is stored into a folder of its own, e.g. /boot/efi/EFI/<os version>/. On my G50 machine, there were multiple entries, from a variety of my distro tests, including: centos, debian, fedora, mx-15, suse, ubuntu, zorin, and many others. There was also a goofiboot folder. However, the efibootmgr was not showing a goofiboot entry in its menu. There was obviously something wrong with the whole thing. P.S. The output above was generated running the command in a LIVE session! I decided to clean up all the non-default and non-Microsoft entries and start fresh. Obviously, something was corrupt, and preventing new distros from setting up their own bootloader. So I deleted all the folders in the /boot/efi/EFI partition except Boot and Windows. And then, I also updated the boot manager by removing all the extras. Lastly, I reinstalled Ubuntu and closely monitored the progress with the GRUB installation and setup. This time, things completed fine. There were some errors with several invalid entries, as can be expected, but the whole sequenced completed just fine. If you ever encounter a situation where your system is badly botched due to an EFI partition clobbering, then you may want to follow the advice in this guide. Delete all non-default entries. Make sure you do not touch anything Microsoft, if you're multi-booting with Windows. Then update the boot menu accordingly so the baddies are removed. Rerun the installation setup for your desired distro, or try to fix with a less stringent method as explained before. I hope this little article saves you some bacon. I was quite annoyed by what Solus did to my system. This is not something that should happen, and the recovery ought to be simpler. However, while things may seem dreadful, the fix is not difficult. You just need to delete the corrupt files and start again. Your data should not be affected, and you will be able to promptly boot into a running system and continue working. There you go.